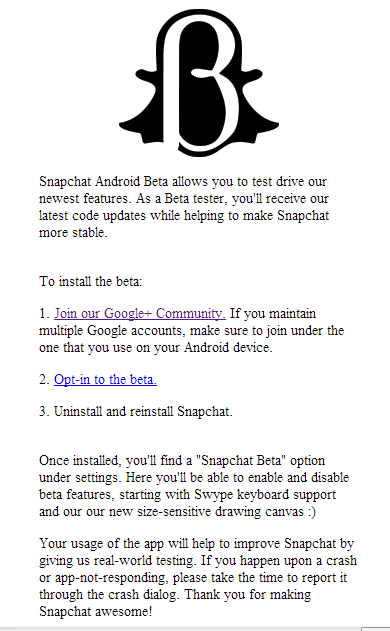 Snapchat has just launched a beta version and is giving you all a chance to be beta testers for the new version. 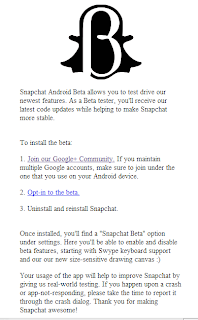 As per the Snapchat blog "Snapchat Android Beta allows you to test drive our newest features. As a Beta tester, you'll receive our latest code updates while helping to make Snapchat more stable." But there is a pre condition to it and here is a simple way to be a beta tester for Snapchat. You have to first visit the Snapchat Google Plus Communities page and join it from your Android smart phone you are planning to install the beta on. After joining in you will have to opt in for beta testing here. After opting in go to your Snapchat App and uninstall it and reinstall it. Once installed, you'll find a "Snapchat Beta" option under settings. Here you'll be able to enable and disable beta features, starting with Swype keyboard support and new size-sensitive drawing canvas. Interested then hurry to the above pages. Still don't have Snapchat on your Android device, visit Google Play it here. The Snapchat available on Google Play has also been updated just yesterday. PS the optin page give error 404 as of now !